You are currently browsing articles tagged General Council. We’ve had a whirlwind of activity in the past few months. That means there’s more reason than ever to fill you in on some of the details! 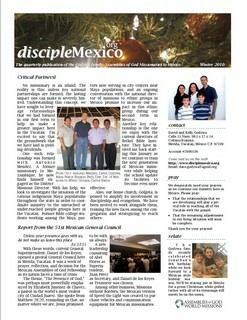 Take a look at our online newsletter to get all of the information. Also, be sure to note our updated address and phone numbers listed on the sidebar. Click here or on the picture to see all that is going on! As you may know, this year is very significant for Mexico as a nation. Not only is it the 200th anniversary of it’s independence from Spain, it is also the 100th anniversary of the Revolution, the event which liberated the country from the dictatorship of Porfirio Diaz and initiated its tumultuous journey to its current condition. The modern Mexico now finds itself at a crossroads. Plagued by the double threat of drugs and corruption, it fights an uphill battle toward progress and tranquility, words that are seldom heard in the headlines that daily remind us of its stark reality. As a fellowship too, the Assemblies of God finds itself at a crossroads. As we stand at the threshold of our upcoming General Council, to be held here in Mérida, we are charged with the task of electing new leadership. Daniel de Los Reyes, our current General Superintendent has reached the end of his term and, because of term limits, he is unable to seek reelection. Also, up for election are the positions of General Secretary and General Treasurer. Realistically, this may mean a complete change in leadership as we enter this new century in the history of the nation which we are called to serve. It is our desire, as we face this critical junction as a fellowship and as a nation, that you would join with us as a missionary body as we pray for God’s will to be done in the proceedings of this important meeting. Our Area Director, David Greco, said it well when quoting from the book of Proverbs, “The lot is cast into the lap, but its every decision is from the Lord.” Therefore, we ask you to join us as we pray that His hand would be evident and that His guidance would be tangible with every decision made and in every vote that is cast. We believe that in the face of the current adversity our fellowship has a critical role to play. It is our desire therefore that at the end of this council we will be able to say that we are better prepared than ever to accept that role and fulfill the mission that God has called us to undertake. Those of you who have read the works of J.R.R. Tolkien and recognize the style of the title of this post are possibly anticipating a story of magic and mystery or an epic struggle between good and evil. In that you may be a bit disappointed. This story is instead about the reality of missionary life. How, try like we may, we are unable to set aside one role for the sake of another. We are missionaries, but we are husbands and fathers first. It all started on Saturday, November 9th, following a long night and an early morning of family activities. (Jonathan had just celebrated his 6th birthday, and had a basketball game the next day to boot.) I was set to embark on a 18 hour bus trip to the Mexican Assemblies of God General Council, a once every two years meeting of ministers, in Puebla. I boarded the bus at 10:00 and began an adventure that would span four days and about $30 in cell phone credit. The first two days were fairly uneventful, a stop for seafood in Champotón, Campeche, a late night taco feast in Cardenas, Tabasco and then the push to reach Mexico City for a bit of a tour of Chapultapec Park and the Plaza Garibaldi, all expected preliminaries as we prepared to participate in what was shaping up to be a fairly important council. 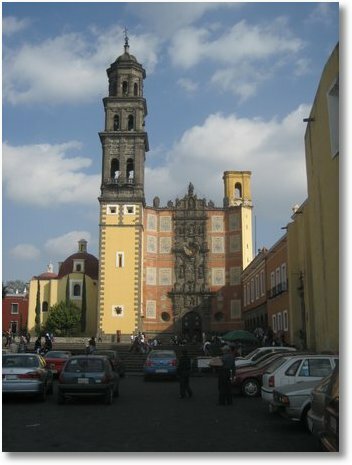 However, the excitement that was generating as we were arriving at Puebla was not related to the council issues at all. “Hi. Hurt my foot. Icing it now,” read the message from Kelly at 11:00 AM Monday morning. The rhythm of the council had been broken, at least for me. I had tried to dedicate myself to the role of council participant, but the role of husband and father had turned my attention back to a different reality. Kelly had fallen bringing groceries in from the car. A false step on entering the house had left her with pain and a rapidly swelling foot. Kelly was putting the best face on the situation, grabbing info from the Internet about how to treat the injury at home. I advised that she head to the hospital for an x-ray, but she was still hopeful that it was only a sprain. A few hours later, I sent another message asking how she was: “peor (worse),” read the reply. So, 18 hours apart, I sat praying and wondering, while Kelly picked up the kids and headed to the hospital for x-rays. The x-rays were taken, and the diagnosis was a slight fracture of the left foot. A splint and complete rest for the foot was the prescription. Bravely, Kelly told me to stay in Puebla. I recommended that she call on a few friends to help with the chores around the house, something that was already in process. Still, the next 8 hours would change Kelly’s situation from difficult to near impossible. A call at 5:00 am on Tuesday woke me up from my uneasy sleep. Jonathan had thrown up 2 times. Now, Kelly not only had to maintain a functioning family, she had to attend to a sick child. I was no longer a council participant, I was a husband and father trying to get back as fast as he could. Phone calls to friends were made, flights and buses checked, and I was on my way. In the taxi at 6:30, on the bus for the two-hour trip to Mexico City at 7:00, at the airport at 9:00 and on the plane by 10:00. 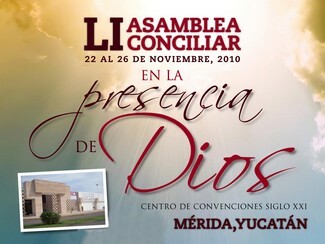 In 6 hours, I was back in Mérida, amazed and thankful for a return trip that took only a third of the trip there. So here I am again in Mérida doing minstry, ministering to my family and injured wife. Instead of voting on measures I’m measuring servings of cereal for breakfast, instead of trips to the convention center, I’m taking trips to school, but I know that I’m where I’m supposed to be. Reflecting on the events of the week, I was reminded that God doesn’t just call individuals to the field. He calls families, and those that He calls he doesn’t leave to fend for themselves, nor does He give any member the ability to specialize (i.e. “My ministry is preach and teach, yours is to the family.”) He has sent us all so that when one is weak another can be strong. It just turned out in this case that the one who was called to be strong had to travel 750 miles in order to get home.